We offer the latest Cutting edge technology for the Early detection of PAD . In partnership with Rex Hospital Vascular & Biomedix PADnet+ testing , we will perform a Non-invasive diagnostic test which can detect blockages in your arteries and asess your quality of blood flow . The PADnet+ system uses Pulse Volume Recordings (PVR) and segmental blood pressure measurments to accomplish this goal. We provide In OFFICE TESTING for your convenience! Early detection is key and is the first line of defense for Protecting your Heart Health! Don't delay, take action and schedule your test today. Click above To Answer some Important Questions! Symptoms are often subtle , Early Detection is essential for effective Treatments . You can fight this Disease! PADnet+ Testing is the first step in getting you the treatment you need. 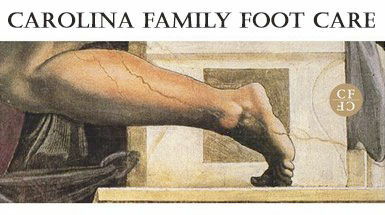 Carolina Family Foot Care will perform this in office test. Rex Vascular Surgeons in conjunction with our doctors will interpret the results. A Comprehensive approach to Lower Extremity issues - Bringing Better Care to our Patients! PROTECT Your HEART and VASCULAR SYStem! Don't delay, Contact our office for your test Today!